Hi Frugalistas! Regular readers will know that one of the key philosophies of frugalfirstclasstravel is enjoying being a temporary local. 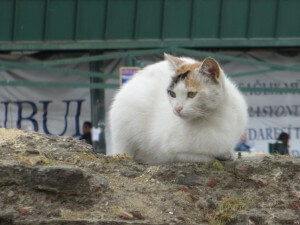 Eating, lots of walking and mixing with the locals is a key part of that. Regular readers will also know how much I love my food. 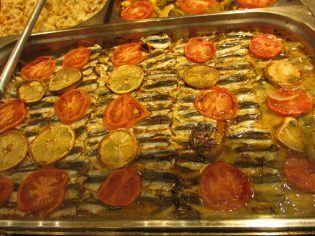 I was therefore delighted to discover the Culinary Backstreets walks offered by Istanbul Eats courtesy of my friend, Jenny, at A Taste of Travel Blog. 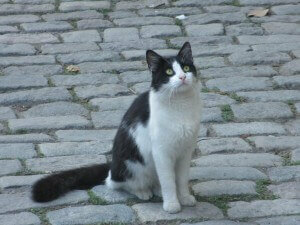 On my recent return to Istanbul I savoured the fabulous offerings on their Cosmopolitan Beyoglu walk. After a short walk to enjoy the local architecture, it’s time for morning tea in the form of borek (a stuffed flaky pastry) and boregi, a soft pastry made with water. We try two boreks – a meat one and a spinach one as well as the boregi. Delish, but morning tea is far from done, as we hit one of the family-run pickle shops that dot Istanbul. 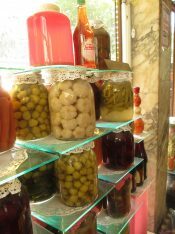 Turks love their pickled vegetables – if it will stay still long enough it seems it can and will be pickled! They also drink the pickle juice as a tonic. I pass on the pickle juice, but am definitely up for a selection of pickled goodies – cabbage, carrot, small cucumber and beetroot (which is a staple of traditional Australian food). It’s all delicious, but the beetroot is the real surprise – gone is the sweetness of the traditional Aussie beetroot, and in its place is earthy, vinegary goodness – I love it! to a little corner café serving traditional doner kebabs. Except the meat is cooked on individual skewers on hot coals. I’m familiar with doner kebabs – they are somewhat a traditional fast food in Australia, and any shopping centre food court will have a kebab place. But these are completely different. Smaller. Spicier. Just better. 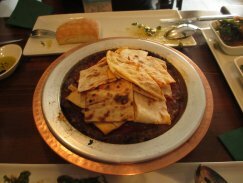 The flat bread it is wrapped in is much thinner, and lighter. Paired with Ayran, a yoghurt drink, it makes a fresh second course for our brunch. It’s a humble little takeaway joint with a couple of laminex tables – somewhere I would never walk into. No brunch is complete without something sweet, so now it’s onto the cakes. We hit the cake shop for a trio of sticky delights. A glace quince complete with more camak is a must try for me. I’m also intrigued by a handmade green baklava, made by rolling powdered pistachio between individual sheets of phyllo pastry, and a “homemade style” walnut baklava. The quince is sticky sweet, and oh so good. The pistachio baklava tastes exactly of sweet sticky pistachio nuts and the walnut baklava is moist and tasty. We Aussies love our lamb. We eat it a lot and I’m no exception. However, I’ve never eaten brains or tongue. 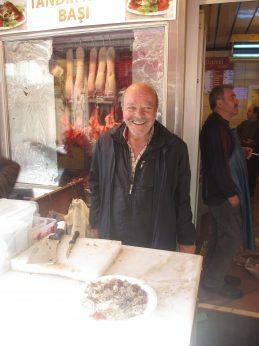 All that changes at our next stop – a stand outside a local butcher’s shop in the market off Istiklal Street, where I’m greeted by the butcher, and a complete, roasted, smiling sheep head. With the delicate touch and precision of a surgeon, and just a bit of theatre, the sheep head is dismantled for us to try. First the skull is cracked open and the brains sliced up. Next the tongue, skun and sliced. Then the cheeks (apparently the most prized cut), and then he heads in the direction of the eyes…. Oh, dear! This could be a bridge too far….. Relief! Turns out we are not eating eyeballs – just the muscles and fat pad behind the eye. 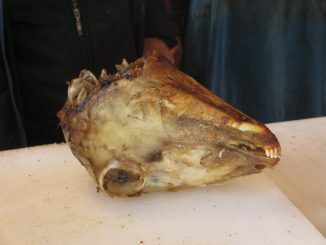 A shake of salt and a sprinkle of oregano, and our sheep head is ready to taste. 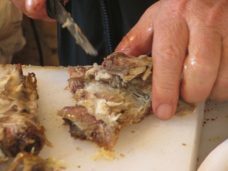 The brains taste just like lamb, only with a creamy texture, the tongue tastes of lamb with a firmer texture and the cheeks taste like the best slow-roasted lamb shoulder imaginable…..And the material behind the eyes? Rich, fatty, meaty yumminess! Down a tiny laneway we head into a tiny hole in the wall that sells coffee. 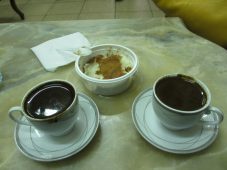 Just coffee, and just Turkish coffee. 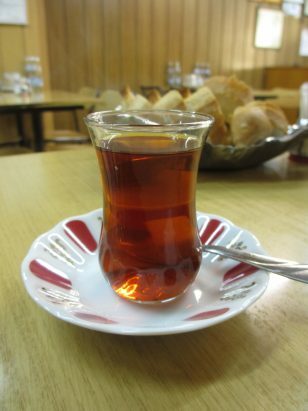 Or Turkish tea if you’re desperate. There’s about 10 tiny stools to sit on, and a similar number outside. A kitchen that’s a metre squared (on a good day) pumps out cup after cup. When you only sell one thing, it has to be good, and this is. I’m familiar with reading coffee grinds in other cultures (a bit like reading tea leaves), so I’m intrigued when I ask Senem about it and she confirms that yes, when Turkish girlfriends are out together, one will often read the coffee grinds left at the bottom of the cup for a bit of girly fun. So we tip our cups up and Senem shows me some of the things to look for in “reading” the coffee grinds. Now, about that pudding Senem bought at breakfast. During our coffee, out comes the pudding. In a takeaway plastic container, and dusted with cinnamon, it turns out to be a sweet, tasty, slightly gluggy (rather than custardy or milky) confection. Do I like it? Definitely. Do I recognise it? No, it’s like nothing I’ve tried before. “What do I think it is made out of?” Senem asks provocatively. The only thing I can think of is the texture of the Turkish ice-cream, which is due to the addition of mastic gum, but no, that’s not it. Chicken breast. Yes, reader, chicken breast! And it’s sweet, pudding-y deliciousness. Finally we reach our last stop – lunch in a family run restaurant from Antalya in the far south of Turkey. 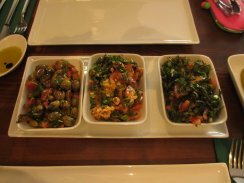 We kick off with a trio of salads, including a fabulous one made from local oregano. Our main course is a clay pot minced meat (similar to what goes into a doner kebab) cooked in a spicy tomato sauce. It’s served with flat bread, so we can soak up all that delicious sauce. To toast the end of our wonderful day, I treat us to a glass of local red wine. Soft and smooth, it goes perfectly with the food, and caps off the most wonderful of days. We thank the chef (Mum) and the waiter (her son), and say hi to her daughter who’s just arrived, before I head off into the tourist madness of Istiklal Street. 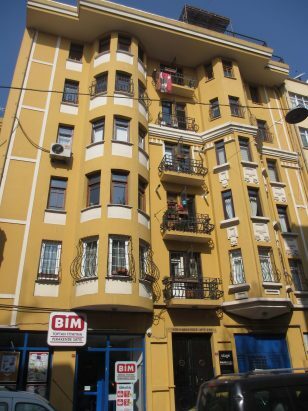 The Cosmopolitan Beyoglu walk was definitely one of the highlights of my two trips to Istanbul. Senem is a knowledgable, fun guide who was tremendous company for the day. She really added to my experience with her knowledge of the Cihangir and Beyoglu neigbhourhoods, and the hidden corners we explored between eating. At US$125 (not including the wine I treated us to at lunch) the Cosmopolitan Beyoglu is not a budget experience, but consider this: the walk goes for approximately 6hours, and you will literally not need to eat another mouthful of food that day. You will visit streets you would never walk down, go into cafes and restaurants where you will be the only tourist, that you would never enter otherwise. Most importantly you will eat food you would never try otherwise and will enter the world of the Istanbul resident, rather than the Istanbul tourist. To me, it is an unbeatable experience that is about far more than just food, and more than justifies the price. You will be doing a lot of walking – and it is hilly at times. Comfy shoes, loose comfortable clothes (especially round the waistline!) and the capacity to spend most of the time on your feet (with a bit of walking uphill), in addition to a healthy appetite are essential. 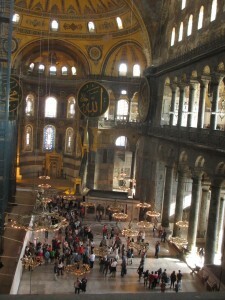 If you are planning a trip to Istanbul, check out guidebooks and hotels via these links. I do earn a small commission if you buy something, but it won’t cost you anything extra – I promise! Author’s note: I received a media discount from Istanbul Eats for this walk. It was a fabulous day, and you know I’d never recommend anything I didn’t genuinely love. Sounds like a great tour – I don’t know a lot about Turkish food (though chicken pudding’s fame has reached me!) but it looks fantastic. I’m off to Istanbul briefly in June so may try and fit this in. Turkish food is great, Lucy, and the walking tour was brilliant. I’m so hungry after reading this. 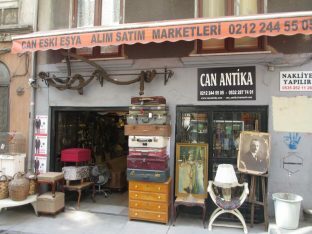 I love the photo of the vintage suitcases in front of the shop. The tour sounds like a terrific way to get acquainted with Turkish food! Yes, and good quality Turkish food at that. I ordered the oregano salad in another restaurant and it wasn’t nearly as good. Looks like a great day! 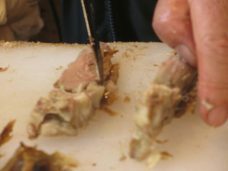 I love going on food tours, and this is making me hungry now! I will have to mark this down for when we make it to Istanbul! Being a temporary local is exactly what Staying Native is all about. Thanks for the insight. Istanbul is still on my Must Travel To list. It was on my Must Trave a To list for a long time, and now it’s a firm favorite. Now, I need to make the dinner I missed earlier tonight. The tour looks like a great way to get an introduction into local cuisine. Learning as you fill your stomach and delight your tastebuds. Thanks Megan. 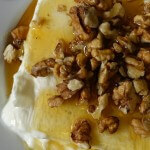 I think this tour would be fantastic to do at the beginning of a trip to Turkey – then you have a good idea of what things are which would be very helpful for more adventurous eating in the rest if your trip! I’m not so sure about the pickle juice as a tonic or lamb brains 🙂 but the rest of the tour sounds amazing. 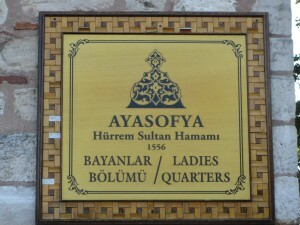 Cosmopolitan Beyoglu sounds like a very authentic way to explore Turkish culture. Even though I love vinegar I did pass on the pickle juice. The brains were actually quite lovely – once you get past the thought. Authentic is a good word to describe the experience! What a wonderful tour and chance to taste a variety of food. The walnut and pistachio baklavas sound wonderful. I may have trouble trying the lamb brain, tongue, and cheeks, but I think I might have tried the pickle brine. While I did pass on the pickle juice, I really see these types of experiences as the perfect opportunity to step out of my comfort zone and try new things – like brains! What is it with the brains? They were lovely! If I saw them in a decent restaurant I’d order them. Now that is a whole different kind of food! That’s what makes travel so special – new experiences, new tastes. Thanks for the education! Senem did ask if I couldn’t/wouldn’t eat anything before we started, so I’m sure the lamb could be substituted. Personally, I’d be going for the pistachio! Loved this! I think the pistachio baklava is my favorite! I don’t eat lamb, but I do appreciate that so many other people do. Funny I just read Linda’s comment and we like the same things! 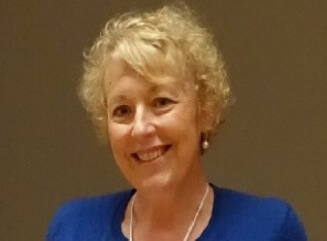 Thank you so much for sharing – I can live vicariously! The pistachio baklava was divine as were all the sweets. In a way I wish the sweets had come earlier in the tour so I could enjoy them more! There were so many things that surprised me about this tour that it’s actually hard to pick one highlight. This is the kind of experience that I would absolutely love. I would do anything to discover that tiny coffee shop!! I must confess, however, that I would 100% pass on the sheep’s head. As a vegetarian who does fall off the wagon, this would be pushing things too far for me! But I admire your bravery! These were so much better than plain old dill pickles! Interestingly they didn’t seem to have a mixed pickled veg mix like you describe or like an Italian pickle veg mix. I’m pleased that the tour can even tempt an almost-vegan! As I said in the piece, it is quite expensive, particularly for a budget traveller. It would be possible to fit this trip into most budgets by making cheaper food choices on other days. I wish I could enjoy the smells as well as the very descriptive photos you shared. What an interesting experience of dissecting that head and then tasting the parts we usually don’t see. Best smell of the day was kebab – meaty, coal fire spicy, closely followed by the lamb, which smelled just like roast lamb. I’ve had other people tell me the same thing menemen cooked at home is never the same – good excuse to go back though! Yum! 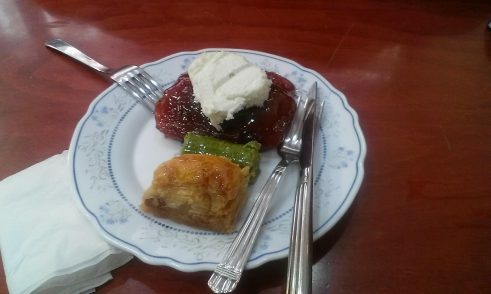 Your post and photos are providing more motivation to learn a bit of (Istanbul) Turkish, or at least, to understand some of what’s being said in the context of going out to eat! 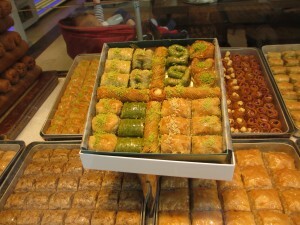 We loved the food in Istanbul and reading this post was making salivate for a return visit. We especially loved the way they serve ice cream. Thanks Jo. Glad you enjoyed it. The ice cream is fab isn’t it?